We use a slow release, professional blend of fertilizer specially formulated for lawns in this area. We also sell fertilizer to anyone wishing to maintain their own lawns. You have the choice to either pick it up or we can deliver to you door. Serving Southern Oklahoma Since 1999! 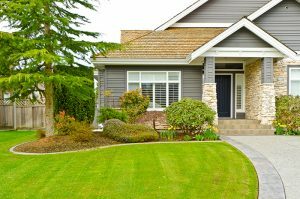 Your lawn is one of the most critical parts of your home. It provides curb appeal and it is one of the first things a home buyer will see. So it’s important that your lawn looks its best at all times. So make sure your lawn is always ready for its big reveal with high quality lawn care and maintenance services that ensure your grass is healthy and beautiful and compliments your home the way it is meant to. Mike’s Pest Control offers exclusive lawn fertilization products, custom services, and only the best expertise to each and everyone of its customers. We are devoted to providing you with the utmost professional lawn care service possible. The Mike’s Pest Control team of expert lawn maintenance technicians are ready and eager to help you restore your greenery back to its original vibrancy and lush. Mike’s Pest Control services strives to adapt the most up-to-date technology and expertise to successfully provide its clients with the most high quality and reassured services around. We work around the clock to ensure that your needs are met efficiently and in a time-sensible manner. 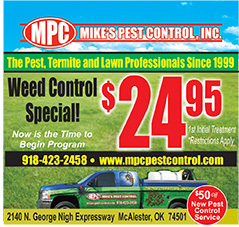 Mike’s Pest Control has been servicing the McAlester Oklahoma region since 1999 with no plans of slowing down anytime soon.